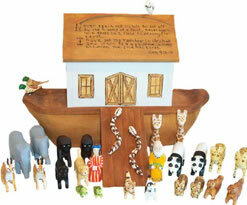 Noah’s Ark Folk Art Collectibles features the work of contemporary folk artist Ted Nichols. His woodcarvings include Noah’s arks, chess sets, checker sets, canes, dogs, orange marmalade potpourri, cats, Americana, folk art paintings, santas, wooden heart bowls, roosters, American folk art and wild life. Click Here Join us at the National Folk Festival in Salisbury Md. September 7-9. The Promise Ark is one of our the most popular arks. We still have a great collection of Barnyard animals that includes a variety of roosters and other farm animals. Lark Books recently published a book on how to make 25 wonderful folk art objects. It is called “By Hand”and is written by Janice Kilby. One of Ted’s Arks is featured along with many other traditional American folk art. 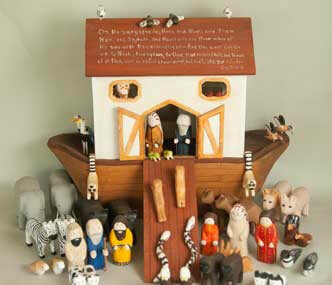 You can purchase the book or Ted’s Mini Noah’s Ark that was designed just for the publication.